The Tellico River and tributaries received national recognition as a premier trout stream years ago and was listed on the Trout Unlimited top 100 streams in the nation. The river starts high up in the mountains on the North Carolina side of the state line in the Nantahala National Forest. This is predominantly a small wild trout stream in comparison to the lower stretches on the Tennessee side. 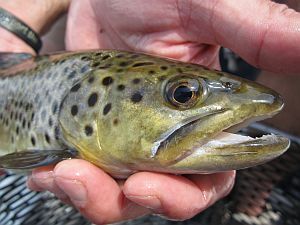 The Tellico meets all the requirements for trout habitat, water temperatures below 68 degrees, heavy oxygenation and clean clear water, and these conditions prevail in the Tellico River corridor. The Hiwassee is holding it's own right now. The water temps are still down in the lower 60's and the fish are doing well. This is a very nice change of pace for us here as this has been the main problem with the river for quite a few years. As a result of this we are having some great days on the water and we are catching some very healthy fish as well. If the current conditions hold and the water stays healthy for our fish then we should have an excellent fall and winter fishery to work with this year as well. The Delayed Harvest on the Hiwassee River, which started last year, is nice to have in that it restricts the taking of fish and gives them a chance to grow. We have been catching holdover fish all season so we know that some are making it through from year to year. 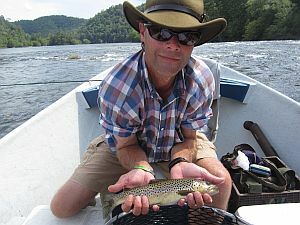 The Hiwassee River is fishing great. So far this summer has been a continuation of the great fsihing we have had all year long. TVA is currently operating Appalachia powerhouse on the sumer recreational schedule. Which is that they will start one generator at 10am, and the 2nd generator will start at 11am and operate at least until 7pm. This schedule will stay in effect until the Labor Day weekend. Our guides have been having some fantastic days on the water with plenty of fish being caught on any given day. If the current conditions on the river do not change then this will be one of the best years of fishing that we have had here on the Hiwassee over the past couple of years. 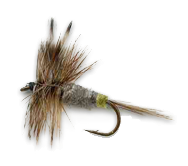 Steamers, nymphs, & dry fly's are all taking fish. You just have to be in the right place at the right time. Our guides work very hard to make this happen as they are on the water constantly. 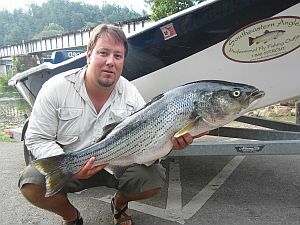 So here it is, This is the first striper caught in the river this season. I went out on the water with a friend of mine today to see if we could find any. We were beginning to wonder if we would see any at all when and then we hooked up. Jerry ended up with one really nice fish. So here's to the first striper of the 2012 season. I spent a few hours on the Tellico River today with some good folks from Ohio. With it being a saturday we knew that it probably going to be a little crowded at all the usual spots. Started fishing around 10 am, finished up around 4 pm and we did manage to find a few nice ones. It did take a little extra effort on our part to find some fesh water but that's just how it is some days. Water temp was around 64 degrees where we fished at. Cloudy skies at first, but it cleared off nicely after a bit. Here's a quick video we shot earlier this year on the Hiwassee. The photos and video clips are from a few trips in feb and early April even though on one of the video clips there is a date stamp with '09 markings. I'm not going to point fingers, you guys will be able to figure out who it is. The powerhouse was operating at a one generator capacity during all these trips. We had some of the best early spring fishing that we have seen in years and it's looking like its going to continue on well into the summer as well. The recreational release schedule will start up on memorial day weekend and continue through the Labor day holiday. We are guaranteed water seven days a week, from 10 am until at least 7 pm.